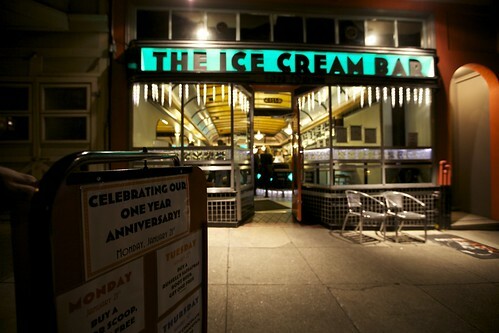 One of the nation's only authentic 1930s-style soda jerk fountain and lunch counter, The Ice Cream Bar, turns 1 this week, and to celebrate, the Cole Valley shop is offering specials all week. Tuesday, Jan 22 - buy a Russell's Sassafras Root Beer and get one free. Wednesday, Jan 23 - buy any size scoop and get a free topping. Thursday, Jan 24 - buy a hot chocolate or hot butterscotch and get one free. 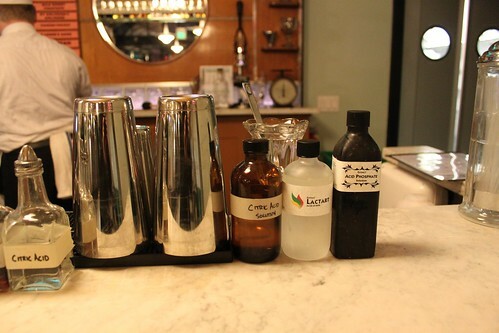 Friday, Jan 25 - buy an angostura phosphate and get one free. Josh and I have frequented the fountain since it opened—it's one of our favorite places to take out-of-towners (or is it just another excuse for us to go again?). But the history of The Ice Cream Bar started long before. For the uninitiated, The Ice Cream Bar is an immersive lesson in history. The fountain itself is a real artifact from the 30s, found in and driven from the fountain's original location in Mackinaw City, Mich. When it came to making the drinks (our favorite part! ), owner Juliet Pries called on the help of Russell Davis (winner of Nightclub & Bar's Bartender of the Year award, previously seen around San Francisco at Rickhouse and now at Rio Grande). Russell, a fun-loving, born-and-bred Texan, who makes drinks with flair (literally and figuratively) took the task seriously, delving deep into bowels of fountain history. 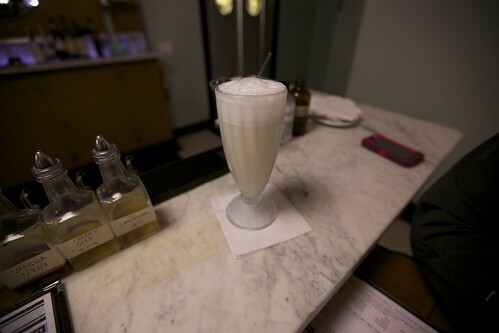 Soda jerk history is not terribly well-written about, and so he not only consulted the de facto authority on soda jerks, Darcy O'Neil's book Fix the Pumps, but also embarked on a quest for primary sources. This search led him to the depths of libraries and, eventually, to a collector of all collectors in Martinez, Calif. This committed curator of a wide variety of things owned orignal soda jerk fixtures—including unopened acids and phosphates, made radioactive by the early overzealous soda jerks who believed that exposing the ingredients to uranium would impart healing properties into the drinks (The Ice Cream Bar is not authentic to history in this way). 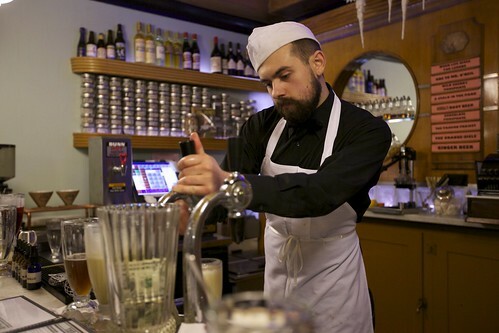 This collector was not necessary a student of soda fountain history, but he allowed Russell to connect the dots for the bar—and buy a bunch of working equipment from the period, too. 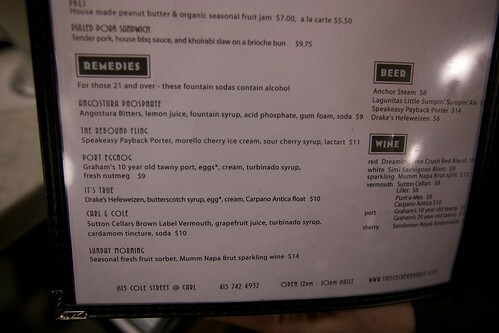 The result is a splendid drink menu that borrows from days of yore and modern mixology. 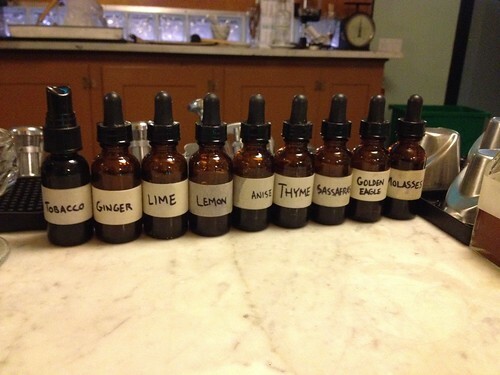 All of the ingredients are housemade, including a wide range of tinctures and extracts (such as anise, thyme, molasses, ginger, sarsaparilla, bitter orange, rosemary, lime, and tobacco), syrups, and ice creams. They also make use of traditional soda acids that keep the cream from curdling and impart a dry or citrusy flavor to the sodas. Soda jerks wear classic garb. 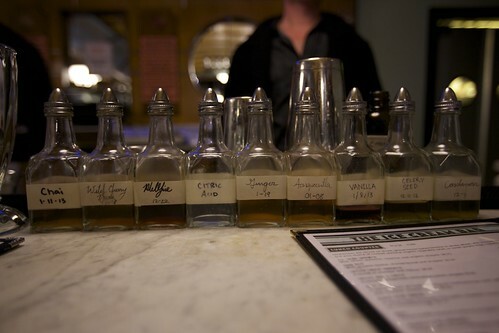 "The cool thing about it is that many of these drinks don't have alcohol in them," Russell said tonight. "It makes you think differently about them." 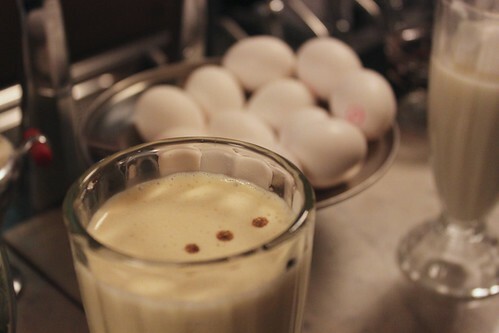 ...the milkshake Too Good to Be True (rye-based butterscotch syrup, eggs, malted cream, blackstrap molasses). It's a rich, caramel, butterscotch delight. 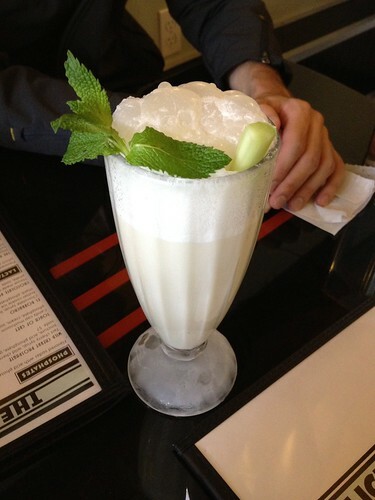 ...and the lactart Stalk in the Park (celery seed extract, fountain syrup, cream, lactart, soda, celery stalk, fresh mint), which is refreshing, light, airy, though also creamy. ...the lactart Ode to Mr. O'Neil (chocolate syrup, lactart, and double-charged soda). It's the perfect drink for someone like me, who loves chocolate when it is dry and not too sweet or rich. 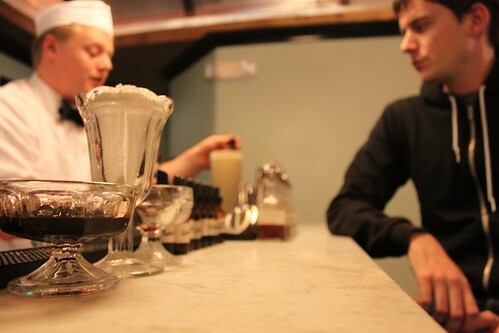 ...and the Hamilton (fresh lemon, a spoonful of ice cream, malt, fountain syrup, and soda). Also light and airy, like a pleasantly carbonated lemonade with malt. 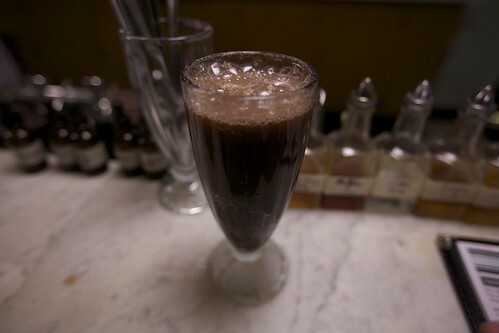 For lovers of classics, we guarantee that you will order the best root beer float of your life. 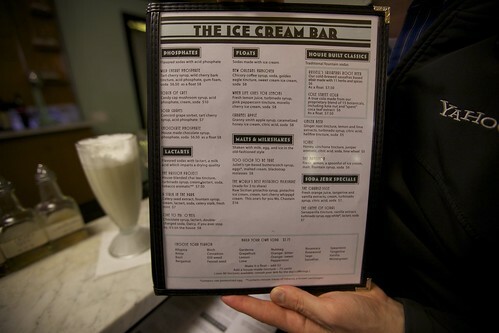 Since we've been to Ice Cream Bar so many times, feel free to browse this slideshow of photos from the shop.